Truly gorgeous property surrounds this raised ranch home. Features 685 feet of road frontage on gosline(splittable) and another 600+ on Montgomery road. Lots of options for future splits. 15 acres total with woods and pond. Home is an 1144 sqft ranch with another 600sqft finished in the walkout basement. Home is larger than it may appear. Move in ready and well maintained. 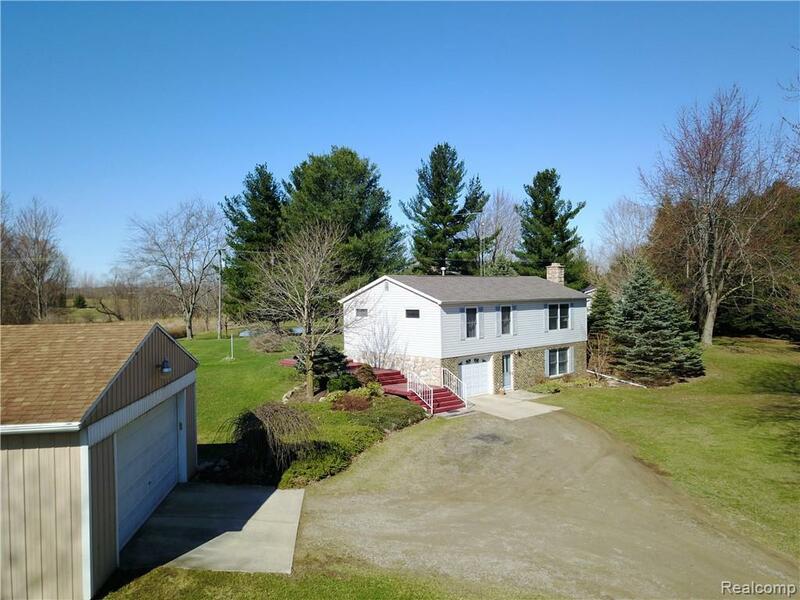 One car attached garage plus a 24x40 detached garage right next to the home and another 24x48 pole barn with cement floor in rear yard near the pond. Great for storage, workshop, etc. Large pond great for fishing, swimming or watching the wildlife come visit. Fireplace in living room. Three season sun room off of dining room. Finished walkout basement offers possible 4th bedroom and another living room. Potential to add 2nd bath there too. Newer Generac automatic backup generator too. Never lose power again. Property is being sold with all 15 acres but seller would sell it on only 10 acres also for $229,900.